Wandering the Guejar Sierra on 2 Wheels. All the excursions are made with a guide who leads the excursion and teaches you how the drive the Segway. The Segway is an electric vehicle with 2 wheels and in that the user drives standing and by leaning the body in the direction that he/she would like to go (right, left, forward, backwards) and the Segway maintains its own equilibrium imitating that of the human driver. 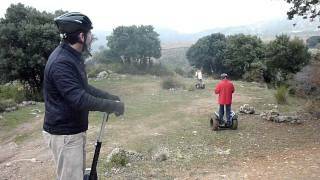 The Segway X2 is designed to go into the countryside and is ideal for these rural excursions. It is able to go on whatever rural trail that you decide to travel and we have plenty of trails for you to try out.